Doncaster’s DB Schenker Rail UK has launched an eco friendly product that allows customers to offset 100% of their CO2 emissions. Eco Neutral, from the rail freight company, gives customers the opportunity to compensate in full for the CO2 emissions through their rail freight services by backing climate change projects that transfer technology and combat poverty across the globe. DB Schenker Rail UK has now become the first rail freight company in the country to provide a fully carbon neutral product to the market. 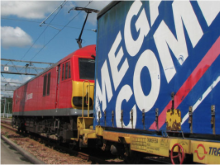 The rail freight company has partnered with climate protection organization Atmosfair, which acts to protect the climate by compensating greenhouse gases through the use of renewable energies. By calculating a customer’s C02 emissions from their rail services, which includes distance, weight, payload capacity, backload statistics, traction type, and fuel/electricity consumption, DB Schenker Rail UK can determine how much the compensation cost will be. The customer can choose which project they wish to fund in order to compensate their CO2 emissions. Examples include the generation of clean electricity through wind turbines or a biogas support programme to guarantee an environmentally friendly energy supply. Steve Pryce, head of marketing at DB Schenker Rail UK, said: “We are continuously striving to minimise the impact of our operations on the environment and are proud to launch Eco Neutral as the first truly zero carbon rail freight product in the UK. Earth Day isn’t just a one-day celebration at DB Schenker Americas. It’s a long-term commitment rooted in a deep appreciation of our planet.